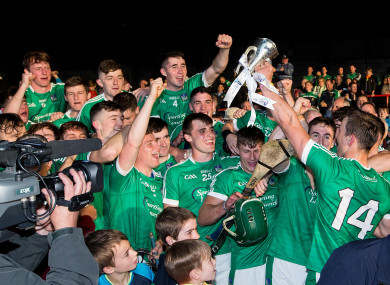 5 key talking points after Limerick’s Munster U21 hurling victory. IF THE REBELS hadn’t started this game so badly, there’s every chance they’d have left the Gaelic Grounds with the cup tonight. They set-up quite defensively against a strong wind in the opening-half, playing with Mark Coleman operating in the sweeper role. But Cork’s attacking game-plan was absent for the opening quarter, and Limerick raced into a 0-7 to 0-0 lead inside 14 minutes. Cork’s play improved immeasurably from that point and they got within four by half-time. Cork conceded just three points as they cut the deficit down to 0-14 to 1-9 by the 54th minute, but a couple of late Aaron Gillane frees helped Limerick limp over the line. Cork outplayed the Shannonsiders for large swathes of the game but ultimately the seven-point head-start they gave Limerick proved their undoing. Referee Rory McGann was ushered away by two gardai after the final whistle as supporters and a member of the Cork backroom team voiced their disapproval at his performance. There were a number of contentious frees awarded to Limerick during the game, particularly the final two which Gillane converted at the death. In fairness McGann did allow Cork the chance to find a late winner by playing more than the three allotted minutes of injury-time, but that didn’t spare him from the wrath of the Rebels after the game ended. In a summer where their seniors suffered another early summer exit, this victory was a welcome boost to hurling in Limerick. Senior boss John Kiely was a happy figure on the field after the game, offering his congratulations to the players, many of whom made up his panel in 2017. A second Munster U21 crown in three years suggests there’s plenty of good talent emerging in Limerick. 14 members of Pat Donnelly’s squad hold All-Ireland winners medals from two years ago and a similar run to glory would really serve as a massive boost. Of course, U21 silverware is no guarantee success will follow at senior level, as Limerick well know. But this latest win certainly bodes well for the future. Ronan Lynch, Kyle Hayes, Aaron Gillane, Cian Lynch, Tom Morrissey and Barry Nash all looked primed for long senior careers. Cork were seeking their first title at this grade in a decade, but they haven’t exactly been starved of underage success lately. They’ve been crowned U17, minor and senior hurling champions of Munster this summer, so there’s plenty of cavalry emerging. But the Rebels were searching for a ‘triple crown’ of senior, U21 and minor titles in the same year, something that hasn’t been achieved since 2005. Prior to that they managed the feat on five occasions between 1966 and 1977. Regardless of today’s defeat, Cork hurling is back on the map. Having lost by just two points, it’s reasonable to wonder how Cork would have fared had senior stars Darragh Fitzgibbon and Luke Meade been available to play. Two of the key lynchpins of Kieran Kingston’s Munster senior title winning side, Cork badly missed the duo tonight. Fitzgibbon was absent through suspension while Meade was out with a broken thumb. It might have been nerves that hampered the Rebels in the early stages of this game and contributed to their slow start. If so, the steady presence of Fitzgibbon and Meade would have greatly helped settle them into the game earlier. Email “Poor Cork start denies them triple crown, massive boost for Limerick and the absence of key Rebels”. Feedback on “Poor Cork start denies them triple crown, massive boost for Limerick and the absence of key Rebels”.